Saffron & Honey Cheesecake – Dig Delve – An online magazine about gardens, landscape, growing & making. Easter is a time for baking, when the gently spiced scent of Simnel cake, hot cross buns, saffron buns and Easter biscuits fill the kitchen. This year, however, I have forgone the buns and fruit cake, which still have a whiff of Christmas about them, in favour of something lighter and more subtle based on an Easter cake traditional in Italy. Known there by various regional names including pastiera napoletana or pizza di ricotta, this is a baked cheesecake, often flavoured with orange flower water and studded with vine fruits soaked in marsala or chopped citron peel. Sometimes bitter chocolate chips are added. A friend brought me back half a candied citron from the market in Palermo last summer, she had been told of the local cakes it was used in and thought I would be able to find a use for it. I have been waiting all winter for the right moment. 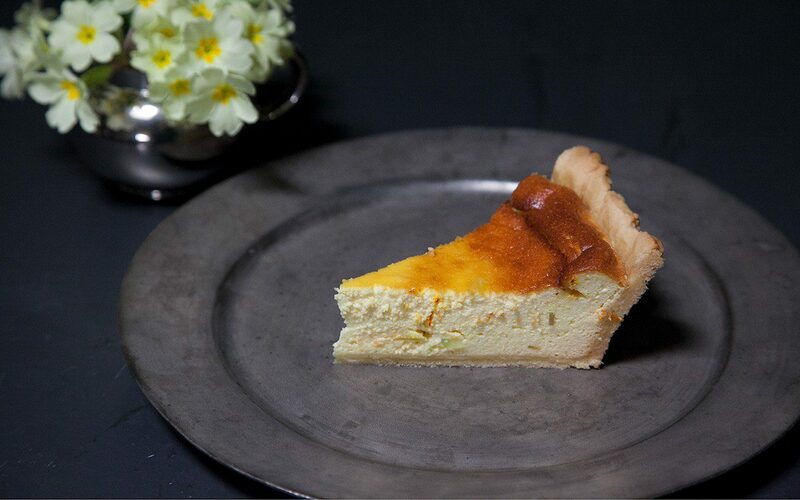 A translucent pale green, the colour of new spring foliage, I imagined it flecked through a primrose yellow custard coloured and flavoured with saffron, a spice with strong associations with Easter and spring, and a natural affinity with both cheese and honey, which I have used to sweeten the cake. The honey was a gift from our neighbours, Josie and Rachel, who as well as keeping chickens, guinea fowl and a brace of beef cattle, have about ten hives on the their land in this valley. Every Christmas we look forward to the bag that they habitually leave by the back door containing a card, some ingots of beeswax and two jars of honey. As this local honey is so special I use it only where its floral flavour can really be appreciated and this cake is the perfect vehicle. After the prolonged cold, grey and wet of the last few weeks, when we are pining for heat and warmth finally, a slice of this cheesecake is light and fresh and the colour of sunshine. 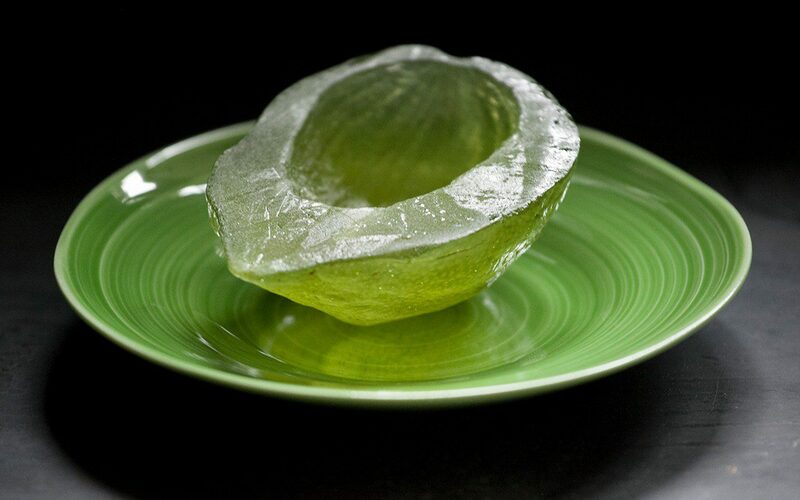 You will need a deep, fluted tart tin or springform cake tin 25cm in diameter. In a very small pan scald the milk for the filling. Remove from the heat and add the saffron threads. Leave to stand until cool. Make the pastry by sifting together the flour, salt and icing sugar. Cut the butter into small pieces and rub into the flour mixture until it resembles fine breadcrumbs. 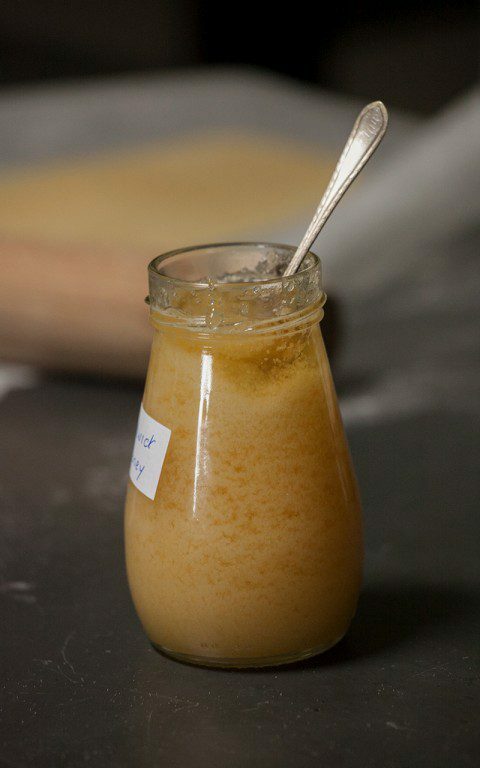 Whisk the egg yolk in a small bowl and add to the pastry mixture, stir through and then add just enough iced water to bring the dough together. Two to three tablespoons should be enough. Quickly and lightly form the dough into a ball without kneading. Wrap in clingfilm and chill in the fridge for 20 minutes. Take the pastry from the fridge, unwrap it. On a lightly floured surface roll out until about 2 mm thick. Use the rolling pin to carefully lift the pastry over the tart tin. Gently press into the base and up the sides of the tin. Trim the overhanging pastry by tearing it away or use a knife if you prefer a tidier finish. Prick the base of the pastry with a fork. Line the pastry case with a piece of baking parchment, fill with baking beans and bake blind for 15 minutes. Remove the beans and baking parchment and return to oven for a further 5-7 minutes until it looks dry and pale gold in colour. Remove and allow to cool. For the filling put the ricotta and mascarpone in a large bowl. Add the honey and stir well to dissolve. 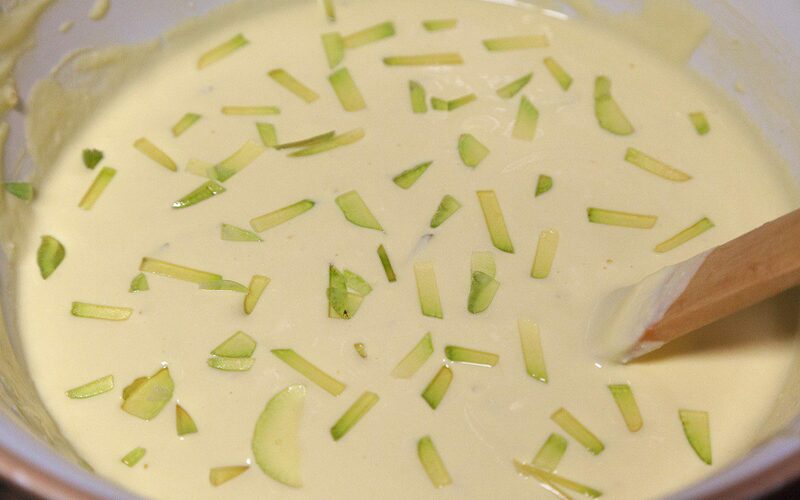 Add the saffron milk and stir well until the whole mixture is pale yellow. In a bowl whisk together the two egg yolks and the two whole eggs. Add to the cheese mixture with the chopped citron peel and stir well. In a clean metal bowl whisk the three egg whites (one retained from the egg used in the pastry) until they reach the soft peak stage. Add one tablespoon of white to the cheese mixture and gently fold in. Add the remaining egg white a tablespoon at a time. When folding in, bring the mixture up from the bottom of the bowl, until well combined. Gently pour the filling into the pastry case. Bake in the oven for 60 to 75 minutes, until well risen and golden brown on top. Remove from the oven and allow to cool. Do not be alarmed, the filling will sink.